Miracles do happen. Indeed, Ethan's life is a showcase of God's miraculous love and power. Thank you so much for your friendship and for faithfully praying and generously giving to the Lord for Ethan. Please see attached on how you can still join us in trusting the Lord to be His channel of blessings and continue to see the wonders of His love by helping meet Ethan's needs until his complete healing in His own time. 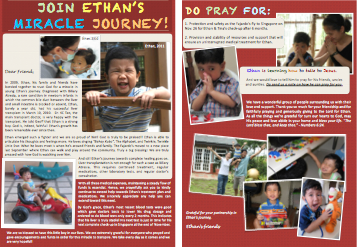 Feel free to pass this letter to people who might be interested to pray and help Ethan in his journey. We appreciate you and look forward to hearing from you. May the Lord fill you with His abundant goodness and ever-present joy! God is, indeed, faithful! Ethan turned 2 last March 27 and his growth has been remarkable ever since the PTLD saga. The procedures were done successfully yesterday (Feb. 12, 10am) except for adenoidectomy which was decided unnecessary if they find "something". But after the operation, while preparing Ethan to be moved to the recovery room, his CO2 shoot up & his breathing became unstable. This was aggravated due to existing colds & fever. Doctors opted to bring him to the Pediatric ICU for close monitoring. As of the moment, he is sleeping well & more relaxed. His heart rate, blood pressure & breathing are more stable. Laboratory (blood tests) revealed stable CBC & other parameters. A tube is helping him regulate Oxygen & carbon dioxide. He passed blood with stool (which was expected according to doctor). He still has fever. Thank you for praying for quick recovery, for quick transfer to the regular room, for protection from hospital-acquired disease like pneumonia & for negative results of the biopsy. Whatever the result may be, it would be treated properly & his liver would remain stable. Ethan is admitted today at the Medical City for lymph biopsy, adenoidectomy & colonoscopy. The primary purpose is to determine the cause of lingering illness (fever, colds, many lymph nodes around neck area, blood is stool). Thank you for praying. Thanks to doctors Mary Jean Guno, Karen Mercado, Bong Franco, & others. Ethan enjoyed meeting his cousins, uncles & aunties during the holiday season. It is heartwarming to hear him say "hi...hello...bye...cars" to almost everyone he meets. He is surely growing as a people-loving-person (and car-loving, too). And we praise God for Ethan's development & milestones. However, what he doesn't know are the streaks of blood in his stool from time to time. For the past two weeks, Ethan has been seeing his new pediatrician and is going through some tests to determine the cause. Initial blood test & stool culture show that he has viruses in his body. His EBV is high and clostridum difficile toxin is positive. His albumin & hemoglobin are below normal levels. On Monday, January 24, he will be admitted to The Medical City for CT scan of the abdomen & neck, excision biopsy of the lymph nodes & administration of albumin. We declare God's sovereignty, goodness & healing over Ethan. Would you join us in thanking God for how He will see Ethan through these tests and ask Him to give wisdom & compassion to doctors? Please pray for peace & strength as his parents go through this process. Pray for protection & provision. PRAY that he will be negative from PTLD - a complication of infection, and other diseases or disorders. Your prayers for our miracle boy matter. May you have a meaningful & Christ-centered Christmas & More Miracles to Come Your Way this Coming 2011! Thank you so much for faithfully praying & generously giving to the Lord for Ethan. These are, indeed, the best gifts we’ve received this Christmas. As we ponder upon Ethan being God’s gift to us, we are reminded that a Savior is born, unto us a Child is given & He is the BEST GIFT ever! We are truly grateful for the gift of life in & through Jesus. "THANK YOU, Auntie Beng!!! Someday, I'm gonna run the marathon with you." "Ethan is fine, he is a very fine boy!" Those are the first words from a straight-forward Dr. Lee Kang Hoe, Ethan's physician at the Liver Centre. eneral lab results show positive improvement. Liver & renal profiles are generally stable except for some parameters that are not yet normal. His platelet is below the normal range, too. Thank you for exalting God with us & praying for Ethan. HE is Great, isn't He! Your prayers matter. God bless you. Ethan has common colds & cough since yesterday. Based from todays blood test results & check up with Dr. Lee, it is due to viral infection. This infection affects the liver which is shown by enzymes (SGPT, SGOT, Alk Phosphatase, GGT) going up. What is good with him is that he is eating well and has no fever. - quick & complete healing from viral infection -- colds & cough. Next blood work & check up will be on Saturday, April 24. God's grace abounds! Ethan celebrated his 1st month with a new liver on April 10. He has passed thru the critical 1st month where most of the major problems occur like duct leaks, internal infection & liver rejection. The next 5 months would still be crucial for Ethan's complete recovery that is why he is monitored closely with twice-weekly check ups. We've had 3 check ups since being discharged from the hospital last April 6. Every check up, he goes thru blood tests & abdominal ultrasound while his lungs gets exercised a lot from heavy crying. And by God's grace, Ethan is doing good! His liver enzymes are steadily getting to the normal level. His electrolytes & blood count levels are all normal. His abdominal fluids become lesser. His color is fairer & eyes are whiter. He rolls over the bed more confidently and finishes 1 bowl of blended food every 3 hours along with Pediasure milk. Doctors want him to catch up on his weight & milestones. Life is indeed God's gift. When we wake up each morning and see Ethan smiling at us, we simply thank Jesus for life. More so, His provisions and grace continue to abound, and we are truly grateful. One of them is our accommodation here. What else can we ask for, we have a first class accommodation at Ate Neri Mamburam's house! Praise God! THANK YOU for being God's instrument of encouragement & provision. Thank you for remembering us in your prayers! In the picture from left: Ethan behind LDLT tarp after checking his blood pressure, Tina & Ethan @ Dr. KC Tan's office during the last documentary shooting/interview & Tina cutting Ethan's hair for the nth time while he sticks his tongue out. Indeed, Jesus is alive and He is here with us. Thank you for always praying for me. It's now 25 days after my transplant and by God's grace, I am doing good. I had episodes of fever, renal dysfunction, gastric problems and elevated enzymes. But now, everything is steadily becoming normal. All my test results are encouraging, my appetite is increasing and my doctors said I can go home on April 6. My face, arms and legs are puffy because I'm taking steriods along with six other meds that I take everyday. Praise Jesus, I can smile, laugh and play with my arms now. Thank you for being a part of my miracle journey. I will still be staying in Singapore for the next two months because I need to see my doctors regularly so they can monitor my new liver. Thank you for all your prayers and support for me, my mom and my dad. Our little way of saying THANK YOU! Praise God! Tina and Ethan are both doing well. Ethan will be celebrating his first birthday tomorrow! Doctor has removed the tubes from Tina, can walk around and reaching 1000ml on Spirometer. Ethan is no longer in sedation and is very stable. See After the Transplant (In Photos). Praise God! Update (March 10, 2010 - 7:00PM Singapore Time): Praise the Lord for the successful liver transplant procedure on Ethan! We praise the Lord for the successful liver transplant procedure on Ethan Fajardo! The doctor is very happy with the transplant and said that Ethan is a strong boy! Thank you Lord for strengthening Ethan. He will be transferred to the ICU anytime now. Tina is in stable condition at the ICU but in pain because of the surgery. She’s on morphine. Tina already knows that Ethan is in good condition. Thank you for all your prayers! God is so good and powerful indeed! The liver transplant coordinator said that this is just the beginning of the transplant journey. We know God will see Ethan, Tina and Geoff through. He will continue to show His miracles in the life of Ethan and the Fajardo family...May His name be glorified through this miracle journey. Pray that Ethan’s body will accept the liver 100%. That there will be no rejection. Pray that God will protect Ethan from any infection. Pray for quick recovery and healing for Tina. The next two days will be tough because of the pain due to surgery. Pray for healing and quick recovery for Ethan also. Pray for strength and good health for Geoff as he takes care of Tina and Ethan. Thank you for journeying with the Fajardos! Our God is an awesome God! See the Hour by Hour Transplant Schedule and Prayer Card (PDF). » [2010/04/05] Ethan's Ready to Go Home! » [2009/12/13] How is Ethan doing? Geoff and Tina dreamed of having a family of their own when they got married in January 2005. They prayed and waited on God for several years to bless their marriage with a baby. Imagine how their hearts rejoiced when Tina finally got pregnant in 2008! Ethan is 8 months old. Along with their family and friends, Geoff and Tina celebrated God’s answer to prayer and eagerly awaited their first baby's arrival. 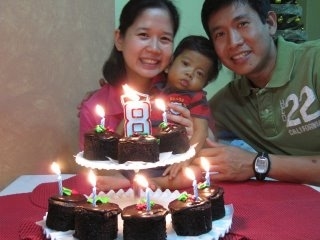 Last March 27, 2009, just two days before Tina’s 34th birthday, Ethan Azariah was born! Geoff and Tina were overjoyed as they witnessed and experienced the miracle of life! Ethan means “strong or firm” and Azariah means “God is my help.” God is truly faithful. A few weeks after his birth, baby Ethan was diagnosed with biliary atresia, a serious but rare disease of the liver that affects newborn infants. The liver damage incurred from biliary atresia is caused by injury and loss of the bile ducts that are responsible for draining bile from the liver. The loss of bile ducts causes bile to remain in the liver. When bile builds up, it can damage the liver, causing scarring and loss of liver tissue. Eventually the liver will not be able to function properly and cirrhosis will occur. Once the liver fails, a liver transplant becomes necessary within the first one to two years of the baby's life. Ethan is now eight months old. God has been graciously sustaining him and his parents throughout this ordeal. 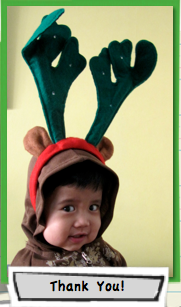 Despite his liver disease, Ethan has turned out to be a cheerful and adorable little boy. He is a source of joy for his loving parents. The success and survival rates for treatment of biliary artresia through liver transplantation have increased dramatically in recent years. And Geoff and Tina continue to place their hope in God as they seek to provide the best possible care that Ethan will require. However, this is an expensive procedure. After prayerful consideration, and given the promising results from liver transplantations performed in Philippine hospitals, Geoff and Tina have arrived at the decision to bring Ethan to the Asian Center for Liver Disease and Transplantation in Singapore. We are trusting God to raise at least 6.65 million pesos (US$133,000). 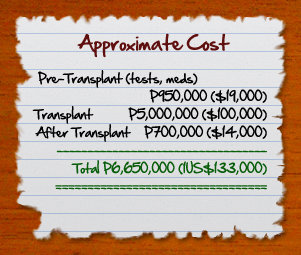 The projected cost for Ethan’s liver transplantation alone amounts to 5 million pesos. P1.65M will go to other medical expenses including blood works, CT's, angiogram, liver ultrasounds, potential donor assessments, airfares, monthly medications... to name a few. The staggering amount is certainly beyond this missionary couple's means. As friends of Geoff and Tina, we are helping raise funds to aid this young family’s journey towards health and healing. Hence, we would like to appeal on behalf of Geoff and Tina for your prayers and financial assistance. Considering the urgent need for the transplant, we are trusting God to move individuals and groups to give any amount that God lays in their hearts to give. 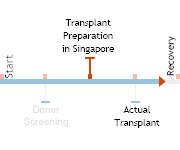 The targeted schedule for Ethan’s liver transplant in Singapore is fast approaching. Payments need to be made a week before the procedure. If you are moved to help, please click here.